My 1947 Camille Daudon bicycle, custom built for Irene Faberge Gunst, is currently in a state of disassembly, so this seems a perfect time to share some details of the frame’s construction. While I have some information about this bike from the previous owner, I wasn’t sure about the steel tubing. Because the previous owner had re-chromed the frame, all the original decals and transfers were lost. 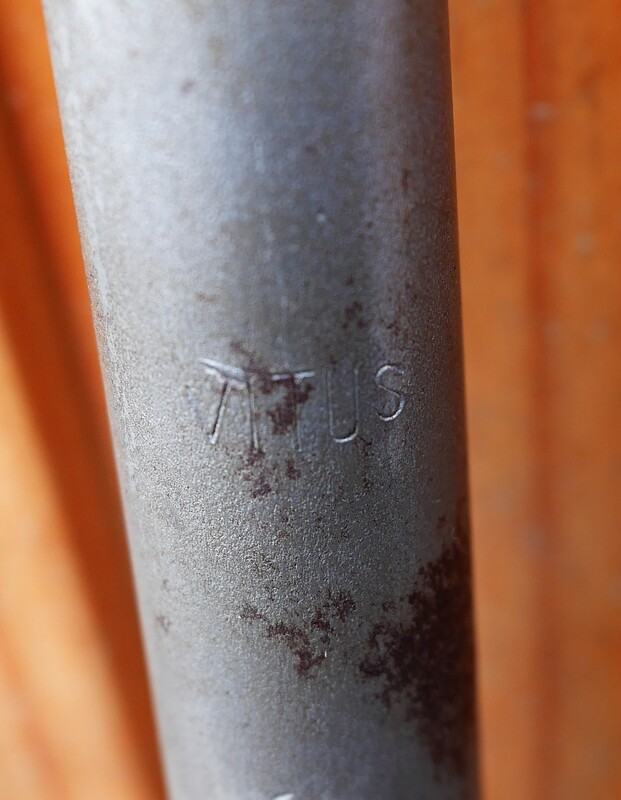 So, I was delighted to see this VITUS logo on the steerer tube when I removed the fork. 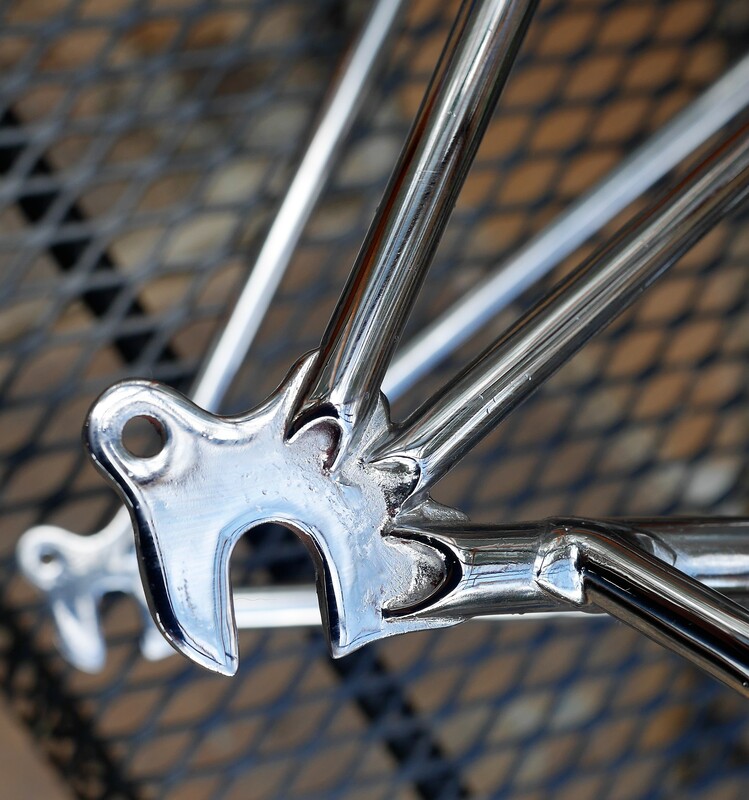 This logo probably means that all the frame tubes are Vitus – a quality steel tubing made by the French company Atelier de la Rive. The work done to create this frame is far beyond anything you would ever see today, except from a custom builder. The creases in the chainstays, to provide clearance for the crankset and the wheels are beautifully executed. 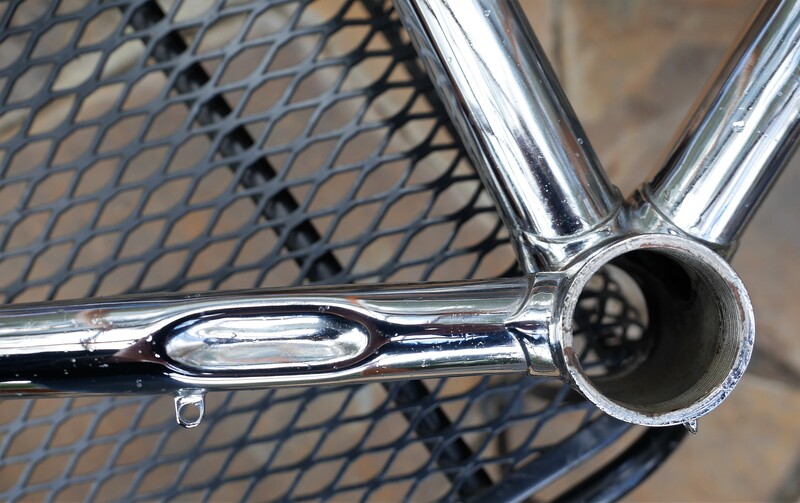 And, the sloping downtube connection to the seat-tube is one of my favorite designs for mixte bikes that use a single, rather than double, sloping top tube. This type of robust brazing firms up the frame, and gives the mixte bike better handling characteristics. 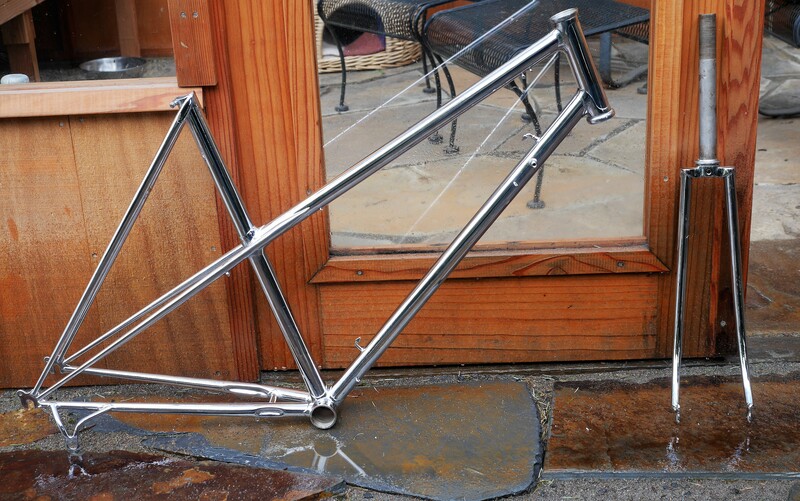 Peter Wiegle has continued this concept on the mixte frames he has built. 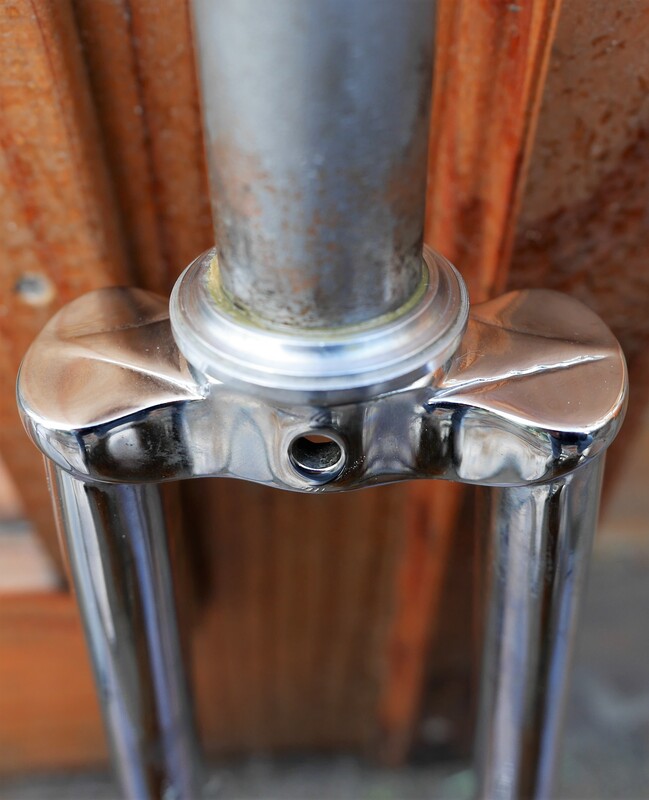 Another interesting feature are the pins used to secure the chain stays, as can be seen by peering inside the bottom bracket shell. 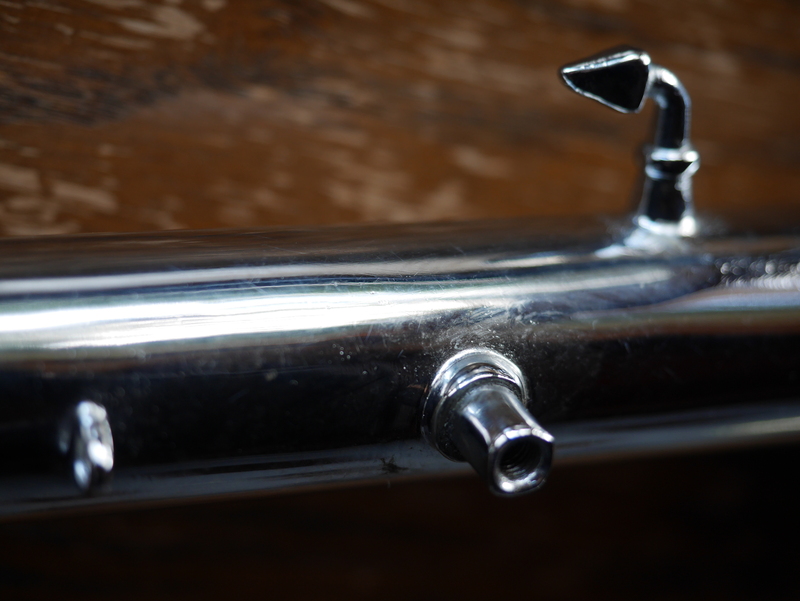 Pinning the tubes was a method used by a number of builders of this era, and is even continued today by Mercian, whose process involves using a brick oven to heat the tubes for brazing. 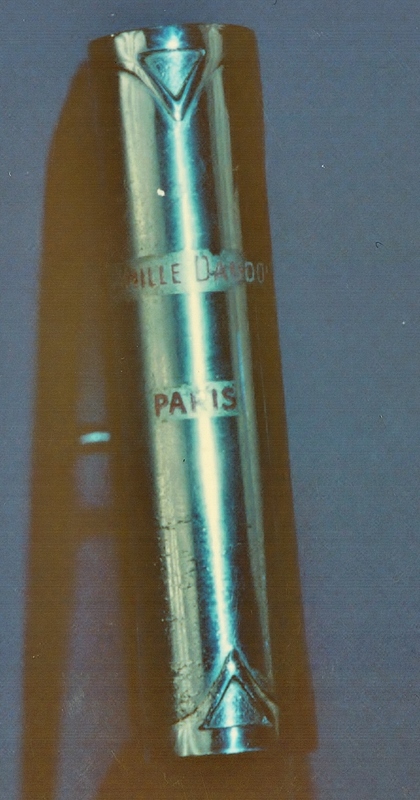 I don’t know whether Camille Daudon used this heating process, as the only tubes which are pinned in this frame are the chainstays. 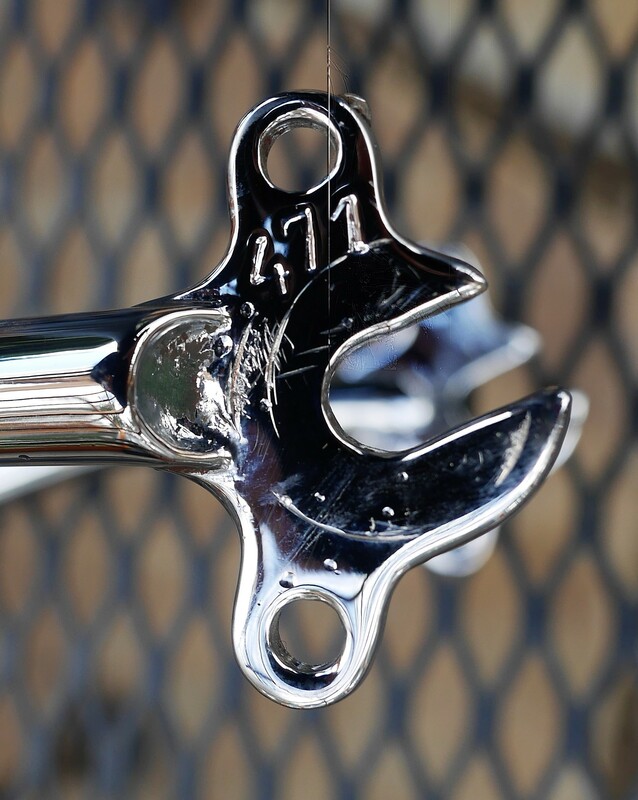 The finish work on the stays is beyond anything I normally see – simply extraordinary. This frame has only a few braze-ons -the shifter mount, pump pegs, and shifter and brake cable routing. Most notably, there are no braze-ons for a dynamo nor for a chain guard. Since this bike was designed for commuting and city riding in San Francisco, that seems odd to me. 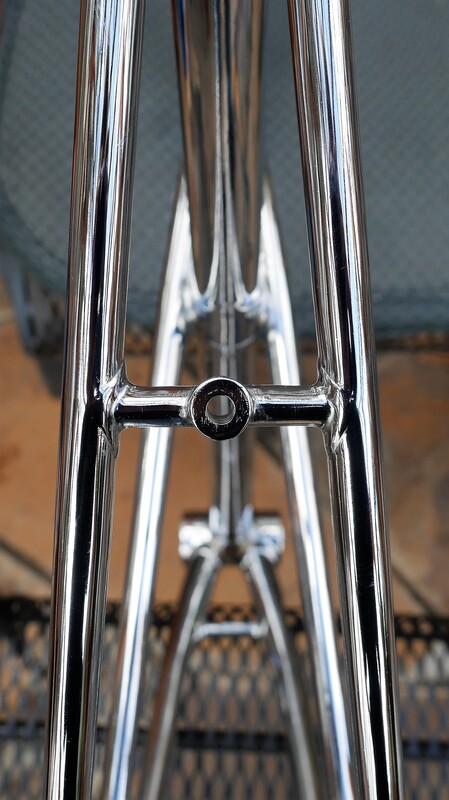 Prior to being re-chromed, the frame looked as above. 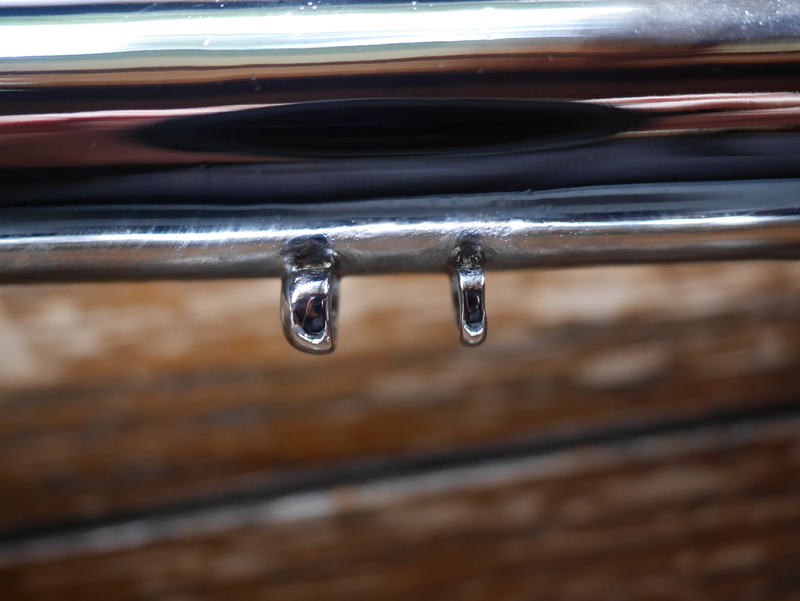 As you can see, the chrome was seriously compromised. 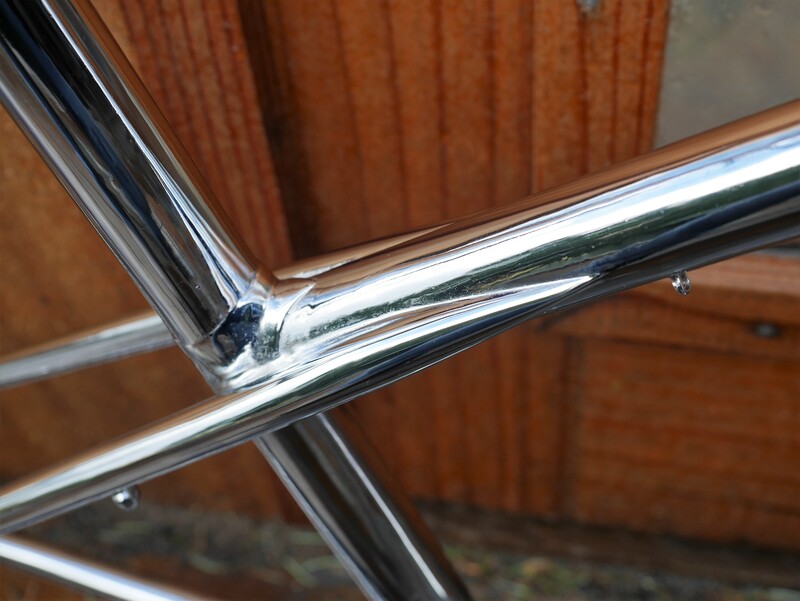 Chroming a bicycle frame is a harsh process that may not yield the results you are looking for. It is very labor intensive, and will remove some brazing material from the frame. 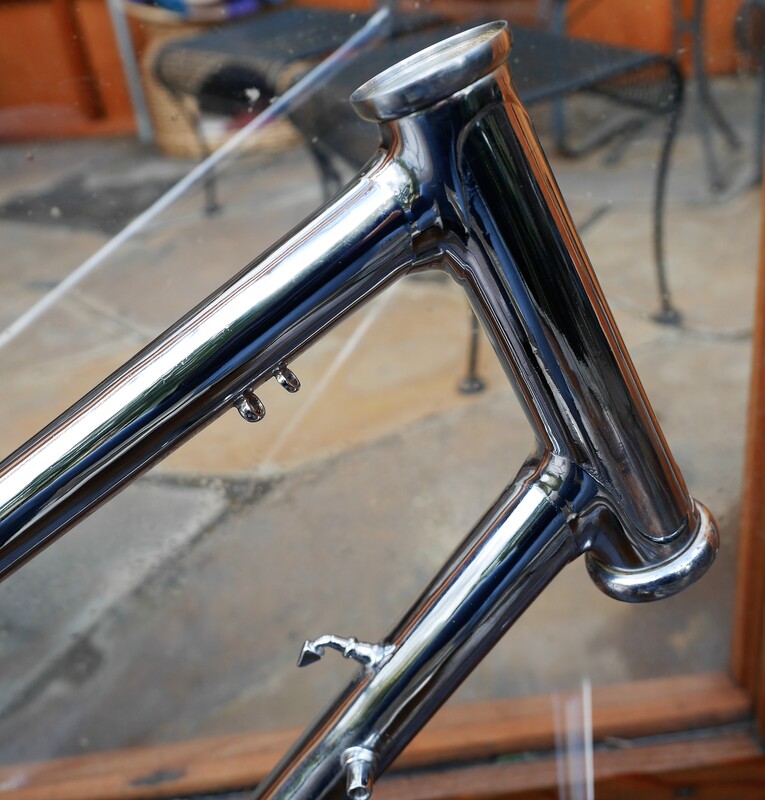 It is essential that the frame be thoroughly cleaned and the old plating removed before re-chroming. 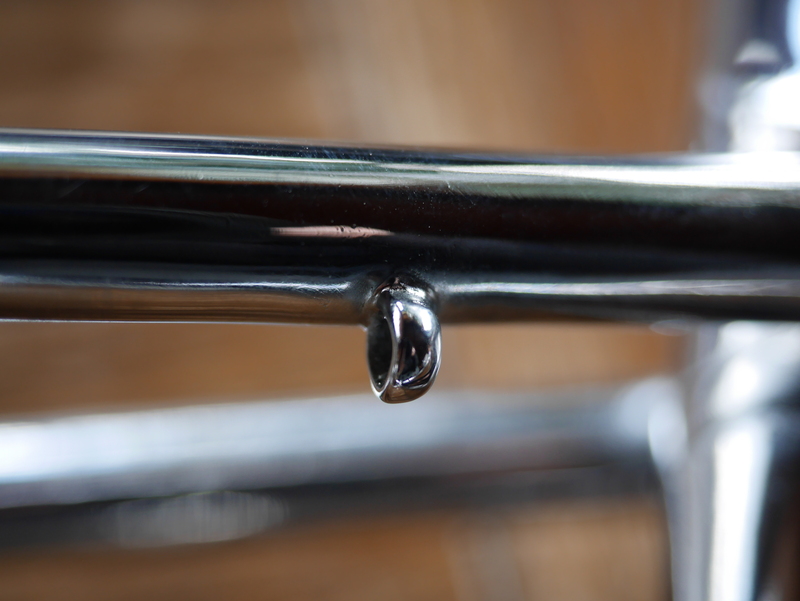 The previous owner thought that he had prepared the frame correctly for the chroming process, but unfortunately a small section of the drive side seat stay developed a hole during the re-chroming, due to incorrect preparation. This is an area of frame construction where failures can develop. However, in this case it looks like the combination of incorrect preparation, along with the harshness of the re-chroming process itself, caused this hole to develop. While it is a small flaw, it’s something to take note of. I haven’t decided yet whether I will try to re-create the Daudon logos which were original to the frame, as shown in the above photo. I love seeing such a large head tube on a smaller frame such as this, which should provide for a comfortable riding experience. Best of all about this disassembly process was seeing the codes engraved on the fork and rear dropouts – “471” which makes me think that this was the very first bicycle off the line from Daudon’s shop in 1947. A nice, and interesting, thought. 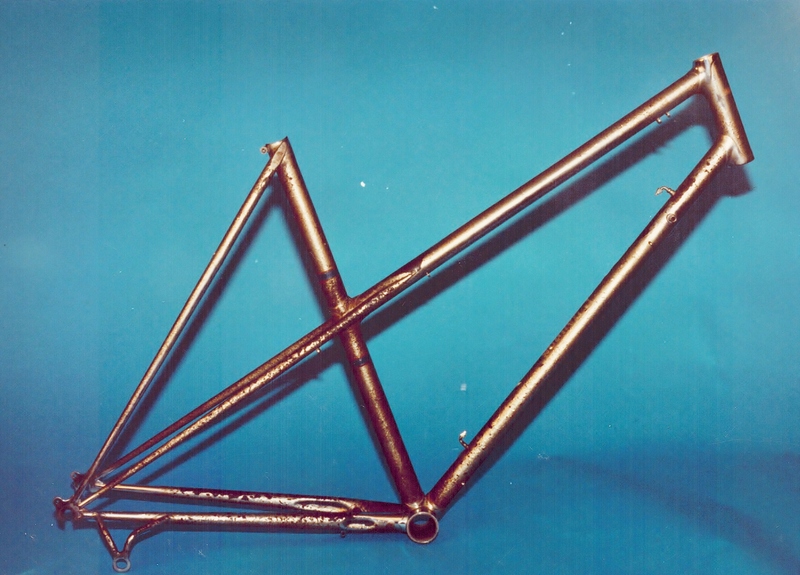 This entry was posted in Bicycle restoration, Camille Daudon and tagged 650b, bicycle restoration, Camille Daudon, Faberge, French bicycle, vintage french bicycle, Vitus, Vitus tubing by Nola Wilken. Bookmark the permalink. I’m happy to hear you decided to go through with the chroming process. What an incredible difference. Now, the big question is where you went for the work! I’m a little unclear. Was the drive side seat stay hole present when you began the chroming process or did it develop as a result of previous poor workmanship? If it was present before you chromed, I’m curious why you didn’t have that repaired? Seems leaving a hole could invite issues in the future. Love those dropout/seat stay caps! 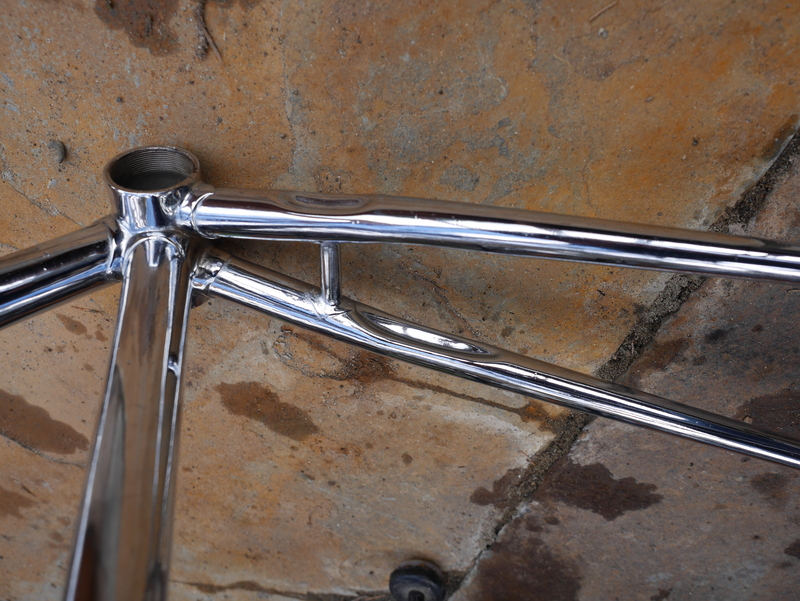 Josh – I did not re-chrome the frame. 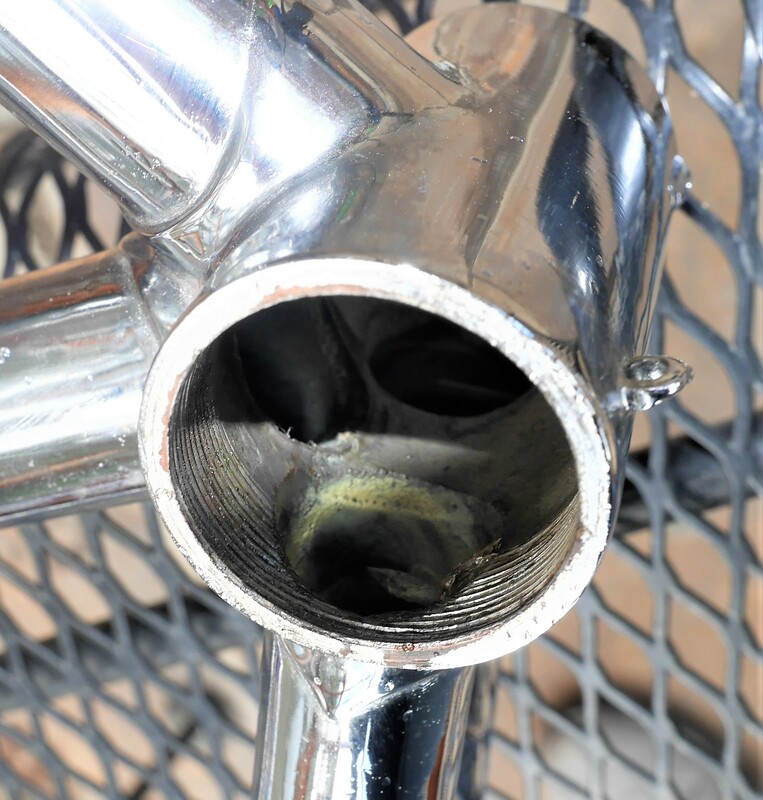 That work was done by the prior owner, and the hole in the seat stay attachment was a result of either an error in his preparation process, or a result from the harshness of the process used to strip the old corroded chrome off the frame. Clearly, some brazing material went missing there, and now the frame’s integrity may be compromised. 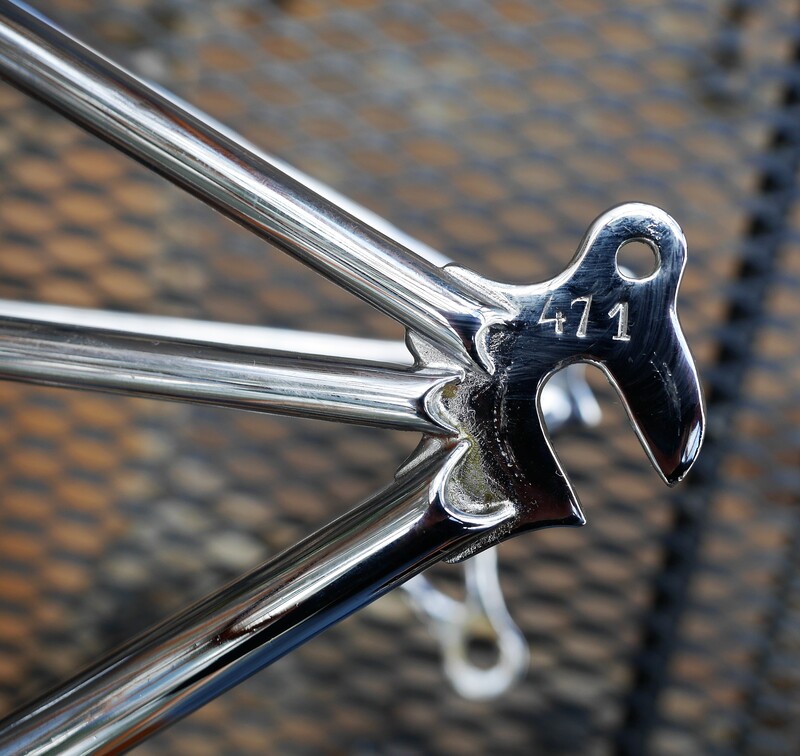 It’s a gorgeous frame, and overall the appearance of the chrome is very nice. To repair the frame now would mean re-brazing that area. That would mean ruining the existing chrome in that area. 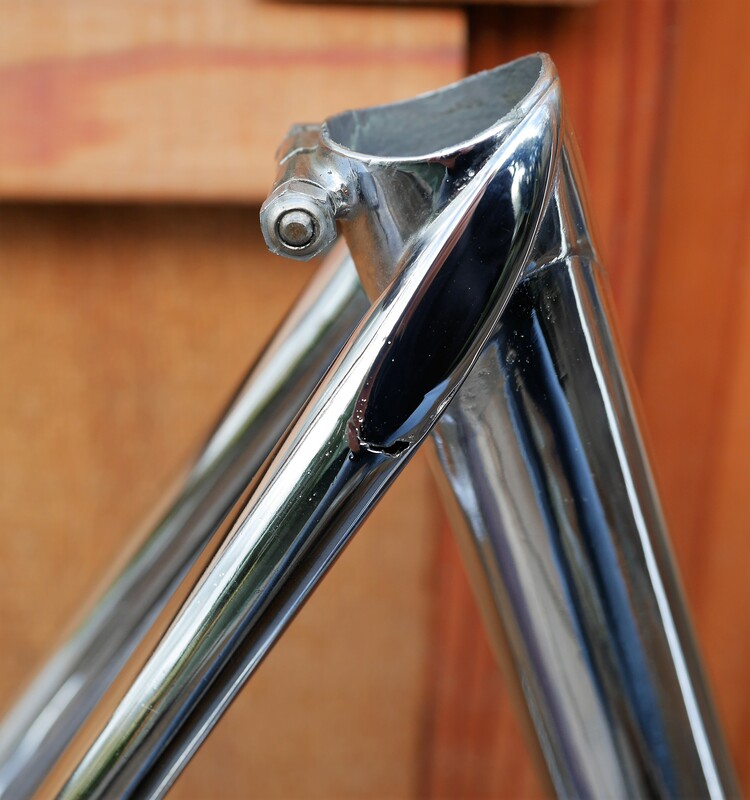 One idea would be to re-braze the seat stay, then have the frame painted, using a classic color as seen on other Daudon’s frames, and mask the stays and lugs so that the benefit of the chrome is retained, where possible. Ah! I see. Thank you for clarifying. Clearly, it is stunning frame and as you know, we all are waiting patiently for your buildup!